Le prix et la disponibilité du produit sont corrects en date du 2019-04-19 18:38:30 CEST et sont sujets à changements. Toute informaiton relative au prix ou à la disponibilité affichés pour http://www.amazon.fr/ au moment de la commande sera d'application lors de l'achat de ce produit. The newest 60-card booster set, Spirit Warriors, takes full advantage of the latest updates to the Yu-Gi-Oh! TRADING CARD GAME! Link Monsters, the Extra Monster Zones, and strategic card placement are key elements in the Decks that can be built from the cards in this set. Spirit Warriors welcomes back a long-time favorite theme in addition to introducing 2 brand-new Deck themes!The Six Samurai return! You already know the story of the Six Samurai and their legendary forebears. Now, take command of the warriors that support them from the shadows every step of the way! By using the new Extra Monster Zone with a brand new Six Samurai Fusion Monster, you can control 6 Six Samurai monsters at the same time. If each of them is a different Attribute, youll be able to use a card that skips your opponents turn completely! These new Six Samurai cards are compatible with the original Six Samurai cards as well, so you can build a brand-new Deck if you want to, or just dust off your old one and update it with new cards.Joining the Six Samurai are two brand-new monster themes that care about where cards are played!Expert marksmen that trigger powerful abilities when a Spell/Trap Card is activated in the same column as one of their monsters! By carefully positioning your monsters and combining them with the column-based Trap Cards from Circuit Break, you can corner your opponent and force them to activate your effects for you!Manipulate the condition of the field with spirits that control the weather! Gather 3 of these spirits on the field and you can Link Summon a monster that grants the monsters it points to total dominance over your opponents cards and effects! 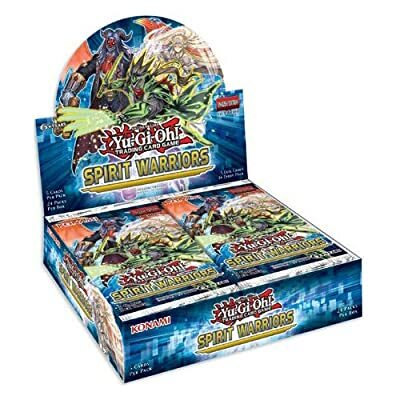 The newest 60-card booster set, Spirit Warriors, takes full advantage of the latest updates to the Yu-Gi-Oh!